The adaptability of the quarter horse breed has allowed it to be used in other occupations such as trail riding and for use by many urban mounted police units. Their even temperament makes them a great animal for new riders learning about horses and their breeding ability has made several stud farm owners both famous and wealthy. It is by far the most popular breed and currently boasts a population of about 3.2 million. The quarter horse breeds usually shown in competition are larger, more muscular horses with wide jowls. Those for reining and cutting are smaller with more powerful hindquarters very agile and quick on their feet. 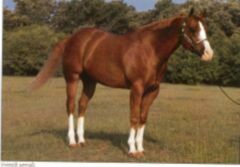 The show type resembles the running quarter horse though some may be taller and slimmer. All quarter horses however have speed, power and are more than willing to please their owners. Their popularity also has them working in rodeo and on ranches and as show horses in show and pleasure events. Their coloring varies from bay, black and brown and includes chestnut, palomino, buckskin and grey. The quarter horse breed is known for its small, short and refined head and straight profile as well as its broad chest and powerful hindquarters. Standing between 14 and 16 hands, about five-feet-tall at the withers, they are bred with two main body types. The stock type, which is more compact and muscular yet extremely agile, and the racing type that may be slightly taller with smoother muscles typically trained for running quarter mile sprints. Read the next horse breeds article on American Saddlebred Horse.